Last year, I brined my turkey for the first time and it was a revelation in flavor. However, that requires a lot of advance preparation: assembling the brine, brining the turkey (an overnight exercise) and (possibly) air-chilling the turkey for several hours in the fridge before finally popping it in the hot oven. This recipe is much simpler and still delivers excellent results. I usually make turkey breast for Thanksgiving because I don't have the volume of guests to justify a full bird. There are advantages to roasting a breast: it's smaller size means less cooking time (usually done in 2 hours or less), and less time in the oven also means there's less chance the turkey meat overcook and dry out. 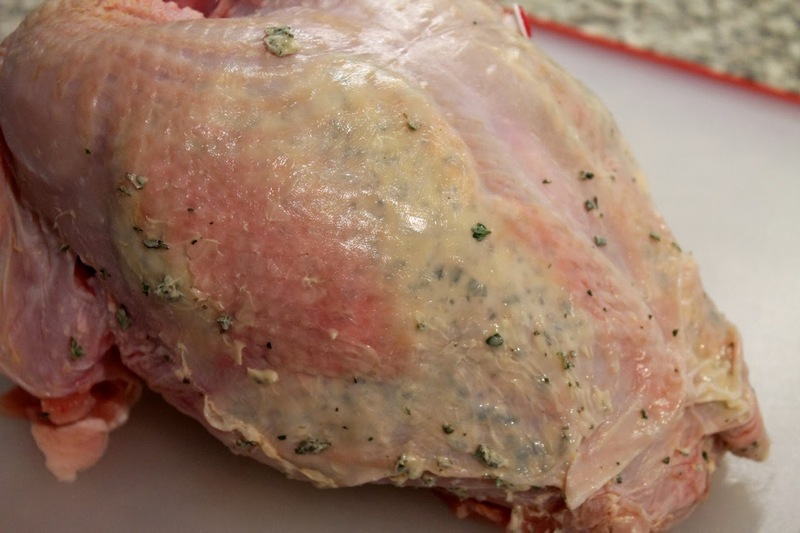 After carefully loosening the skin from the flesh, spread a mix of butter and herbs under the turkey's skin. 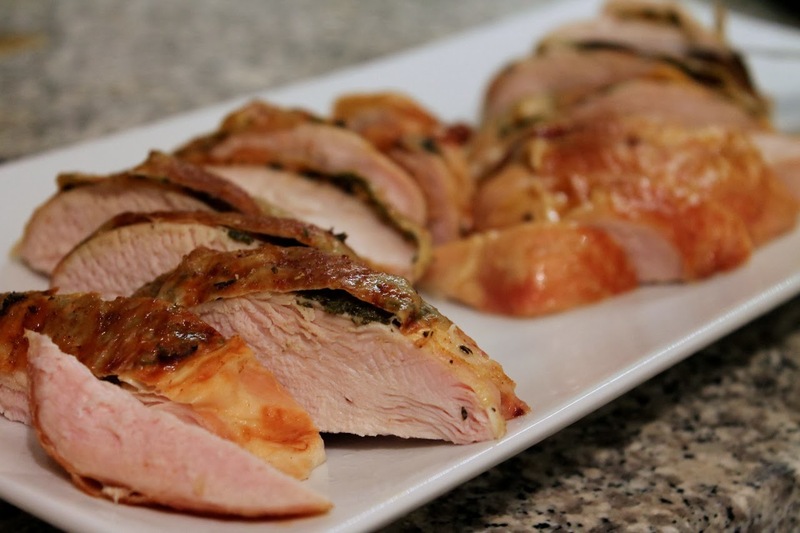 Yes, brining is the best method to fully season the turkey meat. But a good spread of herbs with butter and a little salt will also provide good flavor. Here, I've used my fingers to carefully loosen the skin from the meat and inserted an herbal compound butter between those layers. In addition to seasoning the turkey, the butter also bastes the skin from the inside, promoting crisping. Notice that the pop-out thermometer hasn't popped, yet measurements with my thermometers indicated the turkey was done (which it was--don't trust those pop-out things). Apart from dealing with the herb butter, this dish is so easy. No stuffing. No basting. No tent covering. And the results are tasty and juicy. 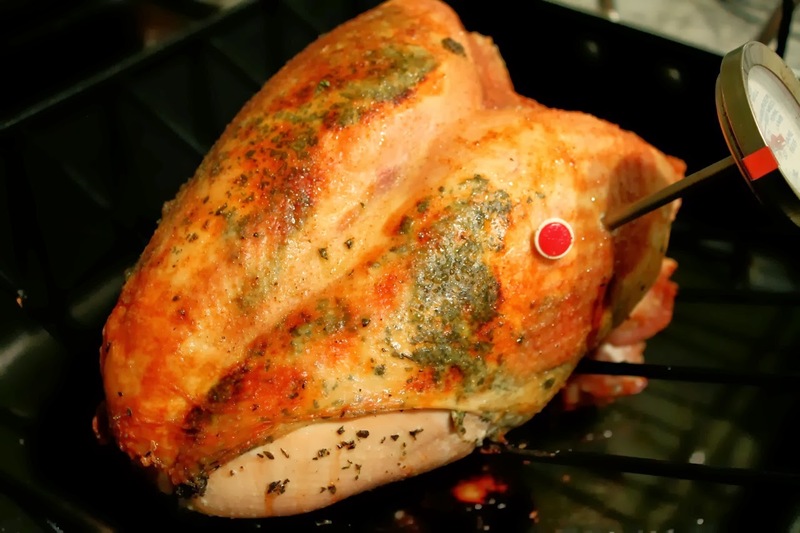 To make sure the turkey is done, I use a thermometer inserted in the turkey while it roasts, and then when I pull it out, I "spot check" with an instant-read thermometer. Don't rely on the little pop-out thingy. I've seen them pop well before the turkey is done and had nicely roasted birds where they don't pop at all. 2. Combine the butter with the chopped herbs and season with salt. Set the turkey on a work space and pat it dry with paper towels. On the narrower end (i.e. not the neck end), using your fingers, carefully loosen the skin. You should be able to slide your fingers all the way up the breast on both side to create open pockets under the skin. Use a spoon to fill both these pockets with the herb butter. Brush the outside of the turkey breast with olive oil and season with salt or seasoned salt. Place turkey, breast up, on a v-rack inside a roasting pan. 3. Lower oven temperature to 350 F and put the turkey in the oven. Roast the turkey until it reaches an internal temperature of 165 F (roasting time will vary depending on the breast weight, but plan for it to take about 2 hours--generally 20 minutes per pound). Remove turkey from oven and allow to rest 15 minutes before carving. Reserve the pan drippings to make gravy. Good turkey, but now that I've tasted your brined version, I'm forever spoiled.